One key thing all dads (and moms) should be looking at when choosing a new toy is whether dad is going to have fun with it too. Quite often this aspect is overlooked and the new toy that was meant to give so much joy becomes a source of conflict or frustration between a child who wants to spend more time with dad, and the father who can’t imagine playing “just one more game.” Here are some toys and games I’ve played with over the past year with my son who is now six years old, but would be good for kids 5+, including readers. Citiblocs. – We’ve reviewed these simple pine blocks before. Because they are thin, you can use them to create all kinds of different structures, doubling or tripling up as needed. Dads can re-find the fun of construction. Sometimes, simple is just better. 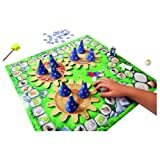 Little Magicians from Haba – This memory game is surprisingly trick for adults because it includes a mechanism for changing up the simple clues we use to remember where things are (upper right, below the mark). The game is also only 15 minutes long even if everyone has a bad memory so dads aren’t locked into an evening of game play. Lego – what dad-friendly toy list would be complete without a Lego. In this case, many six year olds can start to follow the directions by themselves, but construction can be more fun with two. I prefer things that when built, stay built. It’s frustrating for both child and dad to spend two hours building something to see it collapse in rubble within a day. Sometimes, kids want to break them down, but often times, the engineering just isn’t there to hold the toy together without some crazy glue. Lego also has a new set of games which require building the game board. Check out Harry Potter Hogwarts game, for example, which can be played without knowing how to read. 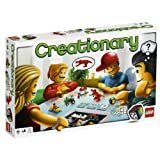 We also like Lego Creationary, a Lego version of Pictionary, where a player builds what he sees on a card while other compete to guess what it is. 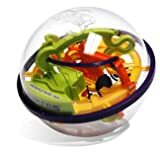 Perplexus – We love the new Perplexus, a new toy that takes the old Brio Labyrinth to the third dimension. Perplexus is a clear plastic globe, with a labyrinth inside. It requires turning the 1 foot in circumference ball over and over to move the ball through a series of maze boundaries and obstacles. Perfect for developing space and motion skills in a six year-old or 40 year-old, this is a toy you and your kids will fight over. Blissfully, turns are very short since it’s hard to keep the ball in play before it falls off a ledge. That doesn’t mean that it’s too hard to be fun. Each challenge is eventually easy to overcome and the player keeps on learning the trips and traps until eventual success. We love magic for little kids because they feel like it’s their own special world and secret. And when you and your child are the only ones who know how you did it, it makes you feel closer. There are a lot of tricks that are easy to do that adults can’t figure out, and even more that are obvious for adults but mystifying to other kids. We like this set of magic from Melissa and Doug because it’s constructed out of wood rather than plastic and has tricks that don’t take a lot of dexterity to do well. Melissa & Doug Discovery Magic Set $11.99 at Amazon. GreatDad.com Review Policy: We received the Perplexus, the Haba Little Magicians, and Citiblocs for sampling at no cost from the manufacturer for the sole purpose of testing the products. The other two products we purchased to play with. We do not accept monetary compensation for reviewing or writing about products and we do not review products in return for free samples. We only review products that we have personally tested and used in our own homes, and all opinions expressed are our own.